Bayardo was a rare breed: a brilliant sprinter and top class stayer, a failure in the Derby but the top rated three year old. Despite behavioural quirks and some questionable rides, he was without doubt one of the best horses of the 20th Century. Foaled in 1906, Bayardo’s sire Bay Ronald was a classy middle distance horse and a good source of stamina. His damsire, Galopin was the 1875 Derby winner and sire of St Simon, one of the greatest stallions of all time. Bayardo himself was described as a fine lengthy bay with well-sprung ribs and a beautiful walk. He was bred by Alfred Cox, and trained by Alec Taylor Jr. He first displayed his talent by soundly beating a three year old horse called Seedcake in an exercise gallop. Intended jockey Otto Madden was so impressed by Bayardo that he mistook him for an older horse, and decided to take another mount in the colt’s maiden race. It’s an error he no doubt regretted, as Bayardo won his debut in good style and Madden was never offered the ride again. Under Bernard Dillon, Bayardo compiled a perfect record in seven races as a two year old. He cosily won the National Breeders Produce Stakes at Sandown, before romping by three lengths in the Richmond Stakes at Goodwood. He followed up with easy wins in the Buckingham Stakes and Rous Memorial Stakes three days apart, although he faced small fields in both. Bayardo proved without doubt that he was the top two year old with an effortless win in the Middle Park Plate, and a three length destruction of the Oaks winner Perola in the Dewhurst Stakes. He looked an excellent candidate for the Classics, and Danny Maher was booked to ride him the following season. Unfortunately, Bayardo had rather tender fleshy feet, and the uncommonly cold winter held him back in training, so much so that Taylor wanted to withdraw him from the 2000 Guineas. However, Cox overruled the decision, and Bayardo finished fourth in the mile Classic to the King’s horse Minoru. He re-opposed in the Derby, but again was some way short of his peak and when hampered by the fall of Sir Martin, Maher allowed him to coast home in fifth behind Minoru, who completed a Classic double. Although he was well beaten in the Spring, Bayardo quickly established himself as the top colt of his generation. He got back to winning ways with easy victories in the one mile five furlong Prince of Wales’ Stakes and Sandringham Foal Stakes, where he conceded 38lbs to future Cesarewitch winner Verney. Bayardo next recorded an impressive win in the Eclipse Stakes, then the richest race in England, coming with a late run to beat Gimcrack winner Royal Realm, Chester Cup victor Santo Strato, and the previous Eclipse winner Your Majesty by two lengths. Bayardo continued his ascent with an easy win in the Duchess of York Plate at Hurst Park, his last race before the final Classic of the season, the St Leger. Despite his earlier defeats to Minoru, Bayardo had proved his quality sufficiently to be rated ahead of that horse before the race. He put the record straight with an effortless win from Valens and Mirado, with Minoru only fourth. The win took so little out of him that Bayardo ran in the twelve furlong Doncaster Stakes two days later, where he again won as he liked. Although he had had a busy season, Bayardo maintained his form well into the Autumn, winning four races in fifteen days. In the Champion Stakes, he displayed signs of temperament at the start when he refused to canter past the crowd and had to be led behind the stands. Nonetheless, he won comfortably by a neck from handicap stalwart Dean Shift and Sussex Stakes winner White Eagle. Two days later, he captured the Lowther Stakes in a canter, followed by the Sandown Foal Stakes and the Limekiln Stakes by fifteen lengths. In his final race for 1909, Bayardo won the twelve furlong Liverpool St Leger by five lengths despite colliding with his rival. 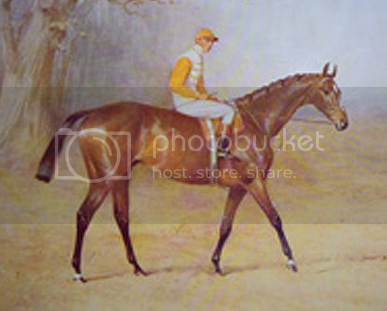 Bayardo’s goal for the following season was to win the Ascot Gold Cup, the most prestigious race for older horses. He started his campaign in April with a win in the Newmarket Biennial Stakes over twelve furlongs. In the Chester Vase, he was held up and very nearly beaten, but just managed to get up by a head in the shadow of the post. Jockey Danny Maher received strong criticism for the ride, which resulted from a belief that Bayardo disliked being in front too early. The same tactics were certainly not in evidence in the Ascot Gold Cup. Given his head six furlongs from home, Bayardo simply ran his opponents into the ground, winning by four lengths from Prix du Jockey Club winner Sea Sick II, with Doncaster Cup winner Bronzino well back in the field. It was a brilliant effort, especially considering Maher didn’t think he stayed the full two and a half mile distance. Bayardo gained a facile win in the Dullingham Plate, before an expected swansong in the Goodwood Cup. He was going for his sixteenth win in succession, and faced only two inferior rivals, although he was required to concede over thirty pounds to them. For somewhat unfathomable reasons, Maher held Bayardo up as the three year old colt Magic built up a considerable lead. Clearly expecting Magic to fade, Maher did not unleash Bayardo until late in the race, and ultimately lost by a neck. It was an unfortunate end to an outstanding career, but Bayardo’s record held up to the closest scrutiny. Retired to stud, Bayardo was equally successful as a stallion. Despite dying aged only eleven, he sired Triple Crown winners Gay Crusader and Gainsborough (who himself went on to be champion sire), as well as Oaks winner Bayuda and Coronation Cup winner Manilardo. Bayardo was an exceptional racehorse, and fondly remembered for his unusual quirks and habits. As well as playing up at the start of races, he had a habit of planting himself outside his box, and commonly banged his chin on his manager, a behaviour known as ‘Bayardo’s drum’. The book Bayardo: The Life, Times and Legacy of an Edwardian Champion is available in the Museum giftshop.